The Nintendo Switch is the hot ticket right now in gaming. It is officially the fastest selling video game console in US history and has had a stunning first year on sale, with massive perfect-score titles like The Legend of Zelda: Breath of the Wild and Super Mario Odyssey blowing away critics. Indeed, it has been so popular that over 10 million units have been sold to date. Chances are then that your friends and family already own the Nintendo Switch, as well as yourself. But, we would argue, to get the most out of the system there are a few more things you should consider investing in. You're going to need some of the best accessories, peripherals and add-ons to take your Switch to the very next level (and beyond). As such, from headphones with unique features to docks that enable you to play tabletop while out on the road, we've collected together the best tech out there for your consideration. For audio, we've got the latest headset from SteelSeries' Arctis range - the Arctis 3 Bluetooth - which uses simultaneous audio so you can use voice chat while still playing on your Switch. We've got a robust yet compact (and officially licensed, naturally) playstand from Hori that will help you make the most of motion control while travelling on a train or away from home. We've also got a protective case from AMDISI that will armour your console up, just in case you happen to drop it while playing in handheld mode. On top of that we've got carry cases for your entire Switch setup, a bevvy of controller options and much more beside. Enjoy! Playing you Switch anywhere is its biggest selling point, but you don't have to a) purely play it in handheld mode or b) rely on the oft flimsy kickstand. That's where the robust Switch Playstand from Hori comes in. You simply lock it into place like an iPad stand cover, adjust it for the perfect angle and enjoy motion control gaming wherever you're sat. It's also compact, folding down to a slim size so you can slip it into your bag along with your Switch console. It even includes a space for your charging cable, so you can keep it powered up while you play. +Ergonomic design+Beats the regular Joy-Con Grip hands down+It's Splatoon 2! Don't let anyone tell you any different - the BEST way to enjoy any Switch game in tabletop mode is with the Pro Controller (unless, of course, it's a strictly motion control affair such as Arms). With an ergonomic design that takes all the best parts of the Pro Controller from Wii U (by way of the ever copied Xbox 360 pad), and you've got a pad that's leagues better than the regular Joy-Con Grip that comes packed in with your console. Oh, and what's not to love about that '90s-style colouring and motifs straight out of Splatoon 2? Ostentatious? Yes. Worth it? Absolutely. The Switch has been designed to offer gaming goodness wherever you wander, but that doesn't change the fact that its a delicate bit of kit that won't react well to butter fingers and a nasty fall. To keep your plucky little console safe, invest in this shockproof case from AMDISI. Its tempered glass design will protect your Switch from falls, scratches, splashes and more. It also comes with a scratch-resistant screen protector to complete the armoured package. While the Switch can't be docked while wearing the case (or have its Joy-Cons removed) it's still a must for handheld gaming away from home. Not only is the Arctis 3 from SteelSeries one of our favourite headsets of 2017, it also just so happens to add in simultaneous audio with its latest Bluetooth edition. Since Switch doesn't support voice chat (at least at the moment), you'll need to reply on third-party apps such as Discord to chin wag with your friends. The Arctis 3 simply uses its wire connected to link up audio from your console, while syncing with your smartphone/tablet for voice chat. Combine that with a stylish design, comfortable cups and an affordable price tag and you've got a must-have stocking filler for Switch owners this Xmas. If forking out for £50/$60 for a Pro Controller feels like too hefty an outlay, you're not out of options when it comes to charging your Joy-Cons and enjoying the power of tabletop mode. The Charging Grip looks and feels just like the regular Joy-Con Grip included with your console, only this one charges up your Joy-Cons while your Switch is docked in tabletop mode. This way, you can simply slide your pads onto the console and slip it out of its dock with a full charge that's ready for travel. And, best of all, it's more than half the price of a Pro Controller. Why invest money in case that looks like every other black nylon model on the market when you can cough up for something truly special? Try making a Switch statement with the Arcade Gaming Case from San Francisco-based WaterField. It's made from premium full-grain leather for longevity (the most expensive you can buy), waxed canvas and a soft, plush interior. It also offers space for all your essentials, including the Hori Playstand, extra Joy-Cons and even a Pro Controller. A set of hidden magnets will keep the whole package secure, while a detachable strap turns it into a fashion forward satchel bag. Nintendo really wants you to use the Joy-Cons in each hand, motion control style (just look at Arms, 1-2 Switch and Super Mario Odyssey for proof of that), but that doesn't make holding the pads for long periods of time any easier. Without an officially solution in place, accessories maker Surge has stepped in with its new Grip Kit. It comes with two ergonomic covers for each Joy-Con, which use a shape that fits the natural contour of your hands (as well as ensuring you've got access to those all important buttons. The pack includes trigger and analog stick grips for added traction, and comes in a variety of eye-catching colours. How Nintendo and the growing raft of third-party developers manage to fit open-worlds and modern first-person shooters onto tiny cartridges is magic in itself, but those little cards are far too easy to lose. To ensure your diminutive games don't get lost while out and about, invest in an affordable cartridge case from PowerA. Its new range includes this one based on The Legend Of Zelda: Breath Of The Wild, a Tri-Force logo, a Mario 'M' and a Mario 'Q Block'. Each one as foam inserts that support up to 12 game cards or MicroSD cards so you'll always have plenty to things to play when travelling. 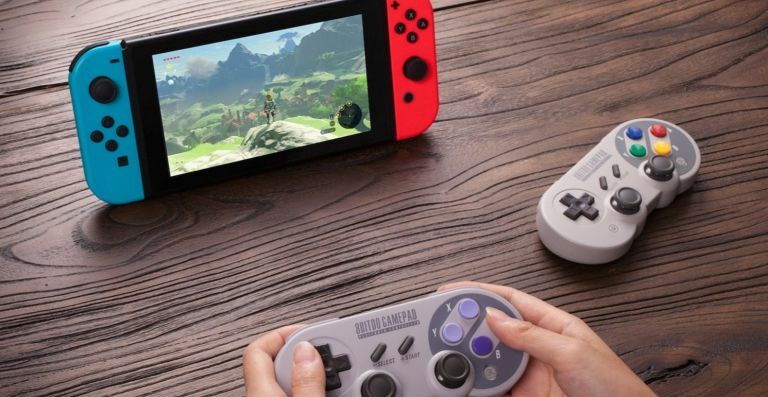 +Connects via Bluetooth+Supports rumble and motion controls+Looks like an old SNES pad! Due for release on 10 December (just in time for Christmas 2017), the new 8Bitdo SF30 PRO Bluetooth Gamepad emulates the classic look of the Super Nintendo pad while packing in plenty of modern features to bring it up to date. Available in both US and UK versions (with region-specific colours true to the original designs), the SF30 supports both rumble vibration and motion controls for perfect syncing with your library of Switch games. It comes with some cute little built-in LEDs, as well as the ability to work with PC (Steam and Windows 10), macOS (10.7 and above) and Android. We love owning physical editions of Switch games, but the high mark up cost makes digital the way to go when you want to avoid paying over the odds. So you're going to need a microSD card with a serious amount of space. SanDisk has you covered, with its new 400GB model. That's a huge amount of space, enabling you to have copies of even the biggest titles on Switch pre-downloaded on your portable machine for endless gaming goodness away from home. With all that extra space, you'll be able to take screenshots and take advantage of Switch's new video capture feature without a care in the world.